“The Saluki, royal dog of Egypt, is perhaps the oldest known breed of domesticated dog. They are identified by some historians as “a distinct breed and type as long ago as 329 B.C. when Alexander the Great invaded India.” Earliest known carvings look more like Salukis than any other breed: they have a Greyhound body with feathered ears, tail and legs. 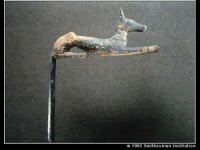 This same exact hound also appears on the Egyptian tombs of 2100 B.C. and again in more recent excavations of the Sumerian empire, estimated at 7000-6000 B.C. The Saluki was so esteemed that his body was often mummified like the bodies of the Pharaohs themselves. The remains of numerous specimens have thus been found in the ancient tombs of the Upper Nile region. As the desert tribes were nomadic, the habitat of the Saluki comprised the entire region from the Caspian Sea to the Sahara. Naturally the types varied somewhat in this widely scattered area-mostly in size and coat. Salukis were first brought into England in 1840 and were known as Persian Greyhounds. There was no real interest until the Hon. 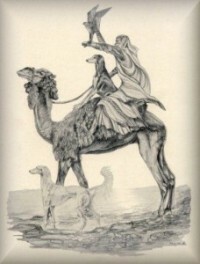 Florence Amherst imported the first Arabian Saluki in 1895 from the kennels of Prince Abdulla in Transjordania. 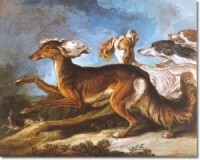 Having tremendous speed, the Saluki was used by Arabs principally in bringing down the gazelle. In England, the dog was used largely on hares. Regular coursing meets are held with judging based on ability to turn quickly and over take the hare in the best possible time. The Saluki hunts largely by sight although he has a fair nose.